Fireworks go boom, and when things go boom, sooner or later somebody gets hurt. For a blow-by-blow taxonomy of fireworks injuries, we turn the Consumer Protection Safety Commission, which each year documents the damage we do to ourselves around the Fourth of July. In 2012, 60-percent of the year's fireworks injuries occurred between June 22nd and July 22nd, sending an average of 200 people per day to the hospital. 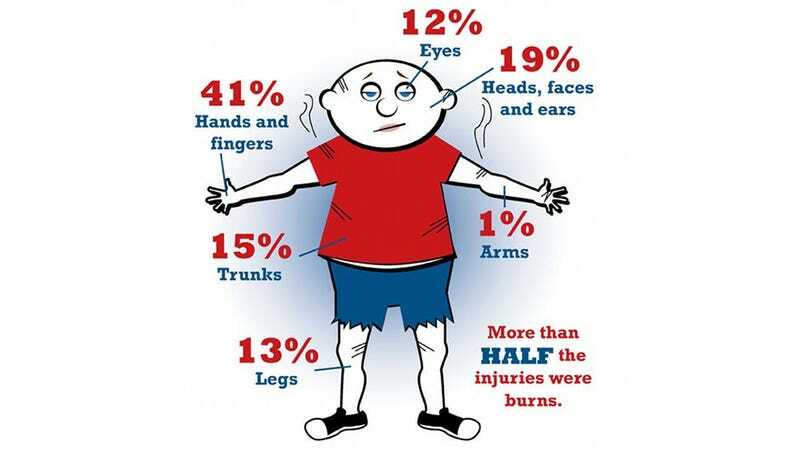 The graphic above represents where on our bodies we managed to get hurt by fireworks last year. While we can't say for sure that people were being careless or stupid when these fireworks injuries happened, we can say that the numbers indicate that risky behavior leads to bad outcomes: All six fireworks-related deaths that happened last year involved illegal or homemade fireworks. Be safe out there people.